Yesterday, I covered the lessons of Dreamforce 2010 from what it revealed about salesforce.com’s going forward strategies, products, vision and other sundries. Concluded that there was some very good stuff. Today we head into the messaging and final thoughts and other resources you might want to read. Even though salesforce.com isn’t known for subtle messaging, they are normally astute and very careful about what they present to the public and how they present it. But, this year, despite the clarity of the strategy and its two themes (at least the ones that I picked out – consumerization of the workplace and developers) it smacked of some hyperbole and seemed to be a skewed attempt at calling something by a name so often and throughout so many different places that just by sheer volume, they were hoping that people would buy into it. A.k.a. the Cloud. I didn’t. At least not the way that it was presented. But I still get it. Mark B. et al can call their products whatever they want – after all they are their products not mine. But, just to be clear, SFDC is not a cloud provider. I think Amazon is a cloud provider. I think Microsoft, via Azure is a cloud provider. I don’t think that salesforce.com (or Oracle) is. I don’t think they meet the test among things that need to be considered are a particular pricing model, and the willingness to host something other than your own stuff on it (meaning say, Microsoft hosting Pivotal or something like that). To be fair, I’ve never heard them call themselves that, but I want to clarify it now as I’ve been doing over the last year. 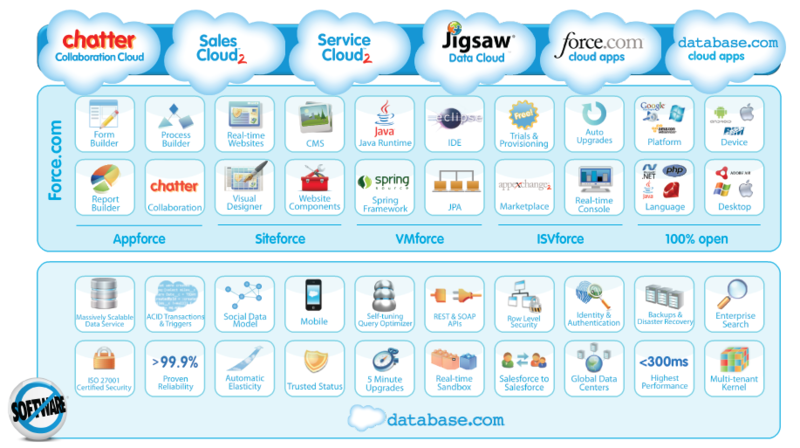 I think salesforce is providing some excellent (some only time will tell) cloud services. I also don’t think that they have seven clouds. Their cloud services are functioning, transmitting, receiving, moving in and providing from the cloud. THE cloud. The ONE cloud. Not 7 Clouds for 7 Brothers…err, Services. For more, see Chris Bucholtz on this here. Calling each new product they have a cloud is a bit of a miscommunication – though its the messaging that they want. In fact, because of that messaging, many of us pundit types are hoping they acquire Cloud9 – just because it would be their 9th cloud. An acquisition for symmetry. There is subtlety in what I find to be one of their most blatant and poorly conceived campaigns – which is their attacks on other vendors like Oracle and Microsoft. Marc attacked Oracle at OpenWorld in his speech there, in a very funny way with “(Ellison’s) clouds in a box are in boxes taller than I am.” Funny, and in response to Ellison’s attack on salesforce, but nonetheless, still silly. Here he went all out with a blatant “Microsoft is the evil empire” campaign, though it too, had its funny moments. In their defense, salesforce isn’t doing anything the rest of the industry doesn’t do and in this case it was in response to something Microsoft was doing to them. As was SugarCRM. As was Oracle. Salesforce feels compelled to do this because everyone does. That isn’t really in their defense, because I find the whole thing ridiculous. As does Denis Pombriant. As does Vinnie Mirchandani. I’m glad to say that SAP and Sage don’t indulge in that very much. They take the high road, most of the time. If they differentiate themselves, its on the basis of their offerings. Which is how it should be. All in all, I personally find all this nyah nyah stuff pretty much a bunch of industry leaders acting like little brats and doing what one did when one was a little insecure kid, which is to try to belittle and bully your playmates. Or at least to one up each other. I’ve never understood why it was “necessary” to “differentiate” one’s company by acting like a four year old. Does that differentiate you from them acting like five year olds? Stand on the merits of what your offering is. Frankly, while what you, vendors, are doing may be funny to you and your acolytes, you tell me a line of business decisionmaker who says, “Oh, I bought (fill in the vendor) because they had really hilarious infantile attacks on (fill in another vendor).” If you vendors can prove that some company bought your offering because you attacked another vendor – I’m going to find out the names of the executives so that I can see how fast they get fired for spending zillions of dollars of your services because you acted like brats. In all their “history” diagrams about the evolutions of markets, they carefully showed timelines that gave “examples” of companies that were prominent in the different eras of the evolution. But what made them interesting, they clearly grouped existing companies – rivals like Oracle, Microsoft and SAP with companies like Vantive and others who were no longer in business or absorbed through acquisition – to make the point that their current competitors were “obsolete” and “dinosaurs” without saying that. For example, it was no coincidence they grouped Microsoft etc. with client/server even though Microsoft could be also legitimately grouped with cloud, given Azure, but were conspicuously missing. Subtle and disingenuous, though not incorrect in placing them there. Mark made one and only one reference to salesforce.com being “everyone’s cloud company” (not the exact phrasing) but, actually, (I’m listening to Buddy Guy do a great riff while I’m writing this), there is a change in their target markets with that statement. For the last several years, salesforce.com, while not denying their SMB roots nor ignoring their existing SMB customers, had been publicly and vociferously stating their upmarket intentions that were built around a large enterprise focus. This conference made it clear they were now targeting all markets – small, midsized, and enterprise – I suppose because they realized that the cloud makes the cost of a small business customer miniscule as the volume of business increases so they can “afford” to readdress this market – especially since it is still a barely mined market segment for cloud services and applications, yet one that is quite interested.